LOVE LETTERS WITCHCRAFT IT HURTS ME WHAT´D I SAY PLEASE DON´T DRAG THAT STRING AROUND INDESCRIBABLY BLUE YOU´RE THE DEVIL IN DISGUISE LONELY MAN A MESS OF BLUES ASK ME AIN´T THAT LOVING YOU BABY JUST TELL HER JIM SAID HELLO. SINCE THE EARLY 1960s, RCA VICTOR HAD RELEASED THE MAJORITY OF THEIR LPs LINE IN DUAL FORMATS, MONAURAL AND STEREO. THE MONAURAL RELEASES ARE DENOTED WITH THE PREFIX LPM, WHILE THE STEREO IS DENOTED BY LSP... IN 1968, THE MONAURAL FORMAT WAS PHASED OUT IN FAVOR OF STEREO. THE LATER RELEASES OF 1968 WERE PRESSED IN VERY LIMITED QUANTITIES THIS ORIGINAL 1968 MONO ISSUE IS ONE OF THE MOST SOUGHT AFTER ELVIS ALBUMS WITH RECORDING SESSIONS TAKING PLACE OVER AN EIGHT-YEAR SPAN AT RCA STUDIO B IN NASHVILLE, TENNESSEE AND AT RCA STUDIOS AND RADIO RECORDERS IN HOLLYWOOD, CA. IT IS A COMPILATION OF HIT SINGLES RELEASED BETWEEN 1961 AND 1967. THE COVER IS IN SOLID SHAPE, NO WRITING, NO STICKERS, SHARP TOP AND BOTTOM SEAMS - - - SPINE HAS SOME WEAR AT UPPER SIDE... DEEP GROOVE VINYL RECORD HAS SUPERB LUSTER AND JUST SHOWS A FEW VERY LIGHT INNER SLEEVE SCUFFS AND HAIRLINES COME WITH ORIGINAL RCA VICTOR INNER PAPER SLEEVE. 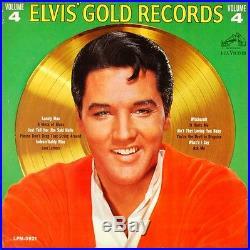 The item "ELVIS PRESLEY ELVIS´ GOLD RECORDS VOL. 4 MEGA RARE 1968 MONO 1st PRESS LPM 3921" is in sale since Wednesday, January 06, 2016. This item is in the category "Music\Records". unlimited" and is located in Paris. This item can be shipped worldwide.